Sustainability has become a popular term in recent years to define everything from protecting the environment to ensuring the viability of family farms over multiple generations to many other facets of modern agriculture. For the Braun family of LeSueur, Minnesota, sustainability isn’t a new concept. They’ve been growing and managing their farm with the future in mind for generations. David Braun, Bob Braun and Brian Braun are brothers and the second generation involved in Braun Farms. Their parents, Paul and Mary Braun, bought the farm homestead from Mary’s uncle in 1950. After the sons graduated from college, they entered a farming partnership with their parents, then incorporated the farming operation in 1995. A third generation has joined the farm in recent years: Bob’s son Nathan Braun in 2007, and Brian’s son-in-law Ryan Thelemann in 2010. For years, the farm included a small dairy cow herd, a farrow to finish swine operation and chickens. In the mid-1990s, the facilities for both the dairy farm and pigs needed updating and were not meeting modern environmental standards. The brothers began researching options that would allow them to grow their business in a sustainable way and manage most of the labor themselves. Through their research, they were connected to the Pipestone System. “We liked the model that allows us to own our hogs. They take care of the farrowing and we can manage the rest,” he said. They purchased two shares in the Pheasant Run sow barn that is located five miles from their own farm. The Brauns constructed a two site wean to finish operation in 1995 and 1996. A 1,400 head nursery barn is located on Dave’s farm and a 2,800 head finisher is located about 3.5 miles away at Brian and Bob’s farm. For nearly twenty years, the shareholder relationship with the Pipestone System has been a good fit for the Brauns. They’ve maintained the two shares, which allows them to finish about 7,500 to 8,000 pigs each year. And, they’ve met their initial goal of being able to manage the workload with minimal outside labor. They work closely with Dr. Spencer Wayne at Pipestone Veterinary Services and the Pipestone team to ensure top quality care for the pigs in their nursery and finisher barns. The Brauns also farm about 3,000 acres of corn, soybeans (both commodity and seed production), and canning peas. The farm acreage has grown over the years through a combination of owning and renting land. The entire operation is designed to be a good steward of the environment, said Brian. Both the nursery and finisher barns have below barn pits that are pumped in the fall and spring . All the manure is sampled and tested. The fields are grid sampled to identify nutrient needs, and manure is applied based on agronomic recommendations by soil type. Both the nursery and finisher are located near waterways and within a few miles of residential housing, so they work hard to be good neighbors. The Brauns’ efforts have been recognized by several organizations. In 2006, the Brauns were one of four farms in the United States awarded the 2006 Pork Industry Environmental Steward Award from the pork checkoff. 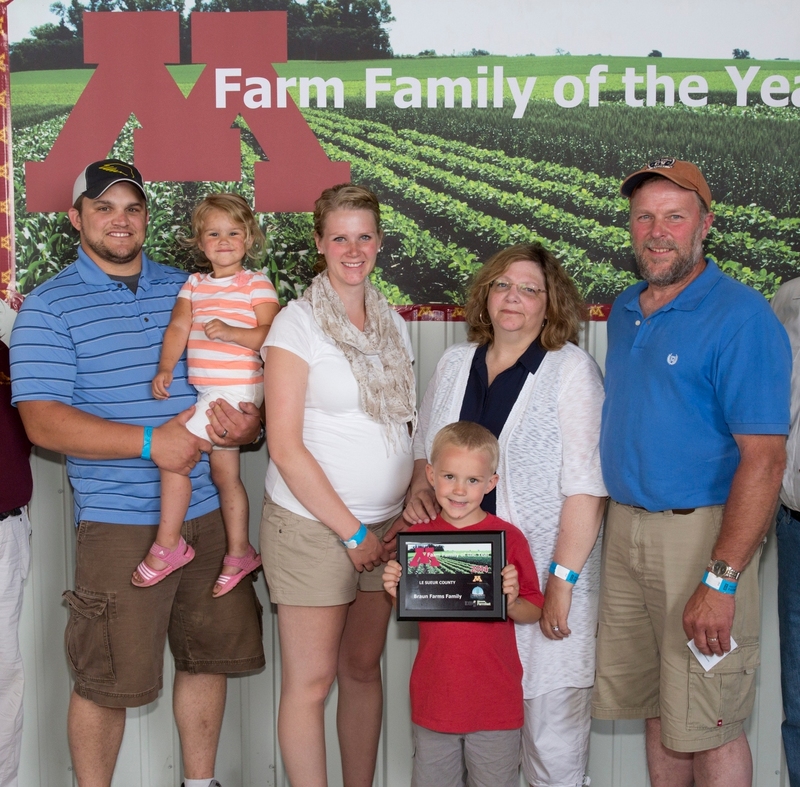 They were named the 2014 Farm Family of the Year for LeSueur County by the University of Minnesota Extension. All the members of the family have been active in church, agriculture and community organizations over the years. Managing the operation with five active partners requires good communications, detailed record keeping, and several trusted consultants.